January 20, 2014, 2:17 PM · I spoke to Midori Goto in late 2013 over e-mail and at her studio at the University of Southern California in Los Angeles. This interview is Part 1 of a two-part interview. Here is a link for Part 2: Midori's life as Distinguished Professor of Music and Chair of the Strings Department at the University of Southern California. There is Midori the performing artist, Midori the recording artist, Midori the former child prodigy, Midori the public educator, Midori the private teacher, Midori the administrator, Midori the advocate, Midori the peace ambassador. And then there is the lovely woman I had tea with in early December, in her studio at the University of Southern California. She is so reserved, who would know she sits atop a mountain of accomplishment, honorary titles and awards? Well, I knew, and I confess, I was a little starstruck. When I was studying violin in college, Midori -- just a few years younger than me -- had already mastered the violin to an astonishing degree, taken the world by storm and established herself in the public imagination -- not to mention the imaginations of the rest of us aspiring fiddlers. I loved her playing then; I love it now. During college, I played a cassette I had of her Dvorak Romance over and over, until the ribbon broke. Born in Osaka, Japan, in 1971, Midori began studying with her mother, Setsu Goto, when she was a toddler. Her mother was a patient teacher, and Midori learned fast. 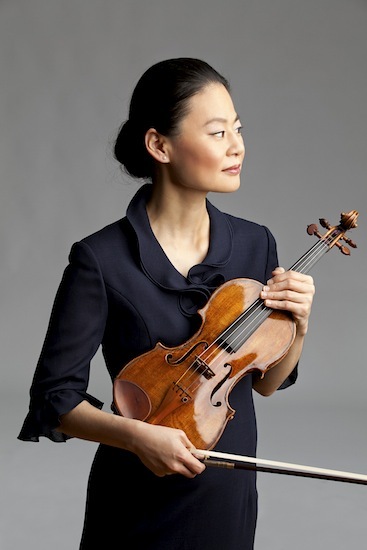 The two moved to New York so that Midori could study with Dorothy DeLay at Juilliard, and she made her debut with Zubin Mehta and the New York Philharmonic at age 11. From many sources, one can discern that it was no easy life, growing up in the public eye. Where most of us can switch violin teachers without much incident, even the New York Times grilled her about the reasons why she quit taking lessons from DeLay at age 15. Her parents divorced, her mother remarried one of DeLay's assistants. Midori struggled with stress, depression and anorexia, for which she was hospitalized for a time. In 2004, she published an autobiography, Einfach Midori ("Simply Midori"), available only in German. Though I do not read German, I understand that it outlines some of these struggles. "I owe a lot of the success of my studio to Midori," wrote V.com member Craig Coleman, who is based in Tsukuba City, Ibaraki, Japan. "She came here 10 years ago and gave a wonderful lecture and performance for my students which I'll never forget." And: "Midori was in the Chicago area working with the Elgin Youth Symphony Orchestra this past weekend," wrote Drew Lecher. "Her generosity of spirit was amazing, as I heard from those of my students in that orchestra. She was and is truly inspirational. I have immediately seen wonderful and dramatic changes in my students that were involved and/or went to observe." In 2007 she was named a United Nations Messenger of Peace. And along with a full performing schedule, which this year includes her first performances in Iceland, India and Africa, it would seem she has increased her recording activities as well. In 2013 she released two recordings, both which have been nominated for awards: a recording of Paul Hindemith's Violin Concerto with Christoph Eschenbach and the NDR Symphony, which is up for a Grammy; and a recital recording with pianist Ozgur Aydin, featuring sonatas by Bloch, Janacek and Shostakovich, which has been nominated for an International Classical Music Award for Chamber Music. She plays the 1734 Guarnerius del Gesu "ex-Huberman" and uses three bows, two by Dominique Peccatte, and one by Paul Siefried. Laurie: I'd never really heard this piece! It's beautiful; it sounds larger-than-life in places, and very intimate in others. When did you begin learning the Hindemith Violin Concerto; how long have you lived with it? Midori: I learned one of the sonatas for violin and piano, now so many years ago, and that was my first introduction to playing Hindemith’s works myself. I was immediately taken by the language of his music -- it is achingly romantic at times, with the rhythmic jauntiness and intriguing harmonic modulations that, combined with my interest in his personal history, I took an interest in learning his other works, including the violin concerto. This was already a while ago and so I cannot remember exactly for how long I have known his works, or the violin concerto, especially because I was already aware of his non-violin works even before I played my first violin work of his. Even the concerto itself, I had known it by ear from an Oistrakh recording. I remember the exact cover of the CD--it was a Chant du Monde label, with the Szymanowski 1, Bartok 1, and Hindemith. I must have had this recording already in the mid-80s! I have been performing the concerto in the last few years, both more privately as well as publicly. Laurie: This work is not played frequently, what made you want to record it? Midori: 2013 was a Hindemith year (the 50th anniversary of the composer's death), and as part of the special celebrations, the NDR Hamburg, with Christoph Eschenbach, invited me to be a part of their special project or recording the complete orchestral works. I was only happy to oblige! Laurie: Reading the liner notes, this concerto had a difficult birth, right at the outbreak of World War II. Do you feel that the music reflects those times, and if so, in what way? In your opinion, in what way does it feel relevant today? Midori: A piece of music is relevant to an individual because of personal and subjective reaction to it, which may be greatly influenced by the environment. The spirit of the concerto, or any musical work, can go beyond what words can explain. I feel that sometimes in our efforts to contextualize the "meaning" behind a piece of music in a comfortable, tangible way, that we minimize its capacity to become personalized for each individual listener. One cannot be taught how to feel, and feelings are not a question of right or wrong. We simply do feel, and we can maximize our perceptibility and our receptiveness in order to empathize and to react. Laurie: I understand your program, Midori and Friends, is celebrating its 20th year. What inspired you start this effort in the first place? Has the mission changed at all over the years? Can you describe any rewarding moments, when you could see that this was helping kids? Midori: Yes, Midori and Friends has been in existence since the early 1990s, having recently celebrated its 20th anniversary year. I am passionate about bringing people together in the context of music. Whether through Midori and Friends, Music Sharing, or other educational initiatives, I am incredibly honored to be able to work with young people with music. However, I must add that there wasn't any single event that sparked my interest in music education projects. Rather, I would say that it was a number of different elements of my own childhood that showed me how a life could be lived from an early age. Commitment to community, dedication to education, and respect for discipline all play a part, I believe, in all aspects of my professional life, including my work through the foundations. And to address your final question: it would be impossible to pick any single moment to highlight as the most rewarding, because the opportunity to be able to interact with children in schools, hospitals, and other institutions, planning for the educational contexts in such interactions -- are what makes the programs meaningful and special to me. Laurie: Are you still doing the Orchestra Residencies Program, and who will you visit next? What do you hope to do for each youth orchestra when you visit? Midori: Yes, I have been very pleased to be able to continue the Orchestra Residencies Program (ORP), and this season I will travel to Kalamazoo, Michigan and Santa Rosa, Calif. for residencies. The international version (iORP) will take me to Bahia, Brazil and Cape Town, South Africa. The program aims to provide unique musical opportunities to youth orchestras, helping to increase the profile of these orchestras through a partnership and a culminating performance with an adult orchestra in the area. My hope for each of these residencies is to have the chance to connect with as many students as possible. Over the years, we have incorporated everything from masterclasses and workshops to specialty performances, demonstrations, Q&A sessions, and other social gatherings with members of the youth orchestras. Laurie: Why do you feel youth orchestras are important for communities? Midori: To me, these orchestras are critically important to communities because they not only offer students of music an incredibly valuable real-world opportunity to perform and share their music, but they also serve as gathering places for other members of the community as well, including parents, friends, and family who might otherwise never get to experience orchestral music. The children in each of these communities deserve the highest quality education. I simply support the efforts of their music teachers and orchestra directors by opening discussions and employing new methods to engage the students, families and community members. These activities, in turn, charge me with inspiration, which I bring to my next destination. Laurie: I was also reading about your Partners in Performance, an outreach program for smaller communities which was funded in the beginning from your Avery Fisher grant. What was the need that you saw, and how did it come to your attention? What has been the most rewarding thing for you about this program? Midori: In the course of my own performing, I have been incredibly fortunate to visit many wonderful venues in cities across the United States and elsewhere in the world. A majority of the best-supported of these venues exist in larger communities and urban centers. One of the reasons I developed an interest in the recitals that Partners in Performance puts on -- chamber music performances in smaller communities without significant financial resources -- is because I realized that people all over the country have a deep interest in experiencing music of the finest quality. Unfortunately, however, many of these people are unable to access top level performances because of the limited resources in their community. Partners in Performance offers recitals by wonderful chamber musicians and, through the generosity of the Avery Fisher grant and other supporters, these recitals are available to presenters at a greatly reduced rate. For me, one of the most rewarding aspects of Partners in Performance is that the presenters keep all of the ticket proceeds from each recital. It is wonderful to hear news of a presenter that used a PiP recital to build new and sustained interest in classical music performances in its community. Tomorrow: Part II, our in-person conversation about Midori's teaching philosophy and her life in Los Angeles at the University of Southern California.